Make soft dough with wheat flour,oats and salt. Roll out a thick roti.Place 2tbsp of the stuffing and close the edges. Flatten it and dust it with more flour and roll out until the stuffing is not seen. Sounds like a healthy paratha Saritha wheat,oats,veges ummm lovely.. This is very nice...lovely combination of flavours. 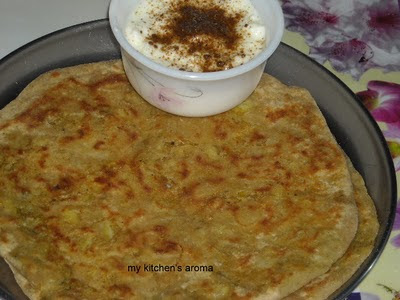 Potatoes and peas partha looks awesome. A perfect combo for paratha, peas and potatoes.